ANKARA, Turkey — Baykar Makina, a privately owned Turkish drone maker, has won a contract to sell six Bayraktar TB2 UAVs to Ukraine, Turkish and Ukrainian officials have announced. The $69 million contract for the sale was signed between Baykar Makina and Ukrspetsproekt, Ukraine’s state-run armament agency. Turkish officials said the deal also involves the sale of ammunition for the armed version of the Bayraktar TB2. In a 2017 deal, Baykar Makina sold a batch of six TB2s to Qatar. The Turkish military is currently using 75 TB2 drones, mainly in its fight against Kurdish insurgents in Turkey and across Turkey’s Iraqi and Syrian borders. The Bayraktar TB2 is a medium-altitude, long-range tactical UAV system. It was developed by Kale-Baykar, a joint venture of Baykar Makina and the Kale Group. The UAV operates as a platform for conducting reconnaissance and intelligence missions. Recently, Baykar Makina launched a naval version of the TB2. In 2011, Kale-Baykar won a contract for serial production for the Bayraktar from Turkey’s procurement office. The second phase involving the development and serial production of Bayraktar Block B (TB2) commenced in January 2012. Bayraktar TB2 completed its first flight in April 2014. The first acceptance tests of the UAV were conducted in November 2014, and six UAVs were delivered to the Turkish Land Forces by 2014. 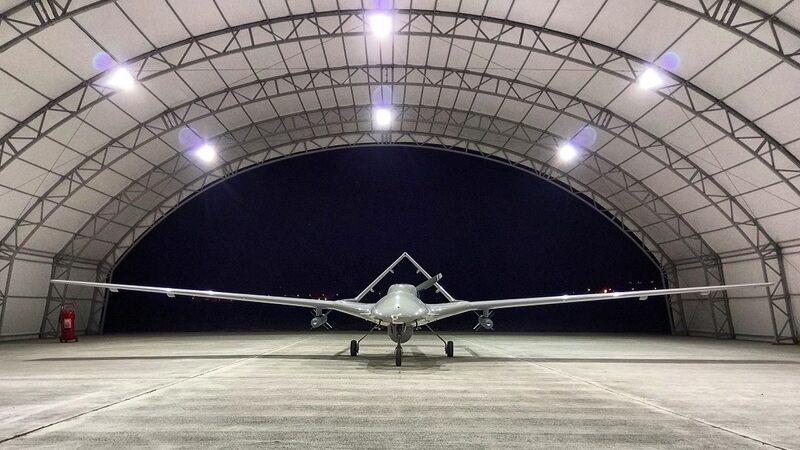 A second batch of six indigenous Bayraktar TB2 drones was handed over to the Turkish Land Forces in June 2015. Bayraktar TB2 features a monocoque design and integrates an inverse V-tail structure. The fuselage is made of carbon fiber, Kevlar and hybrid composites, whereas the joint segments constitute precision computer numerical control (CNC) machined aluminium parts. Each Bayraktar TB2 system consists of six aerial vehicles, two ground control stations, three ground data terminals, two remote video terminals and ground-support equipment. The Bayraktar TB2′s maximum payload exceeds 55 kilograms. The standard payload configuration includes an electro-optical camera module, an infrared camera module, a laser designator, a laser range finder and a laser pointer.